RealtyBlogContent.com is for real estate agents who are interested in learning how to generate real estate buyer leads and real estate listing leads online using high quality pre-written real estate blog content. RealtyBlogContent.com employs a team of content creators, writers, editors and marketers who focus on delivering the highest quality pre-written real estate blog content and internet marketing articles available to the real estate agent community. It has been recommended by several of the top real estate web site and marketing companies including Sizzling Studios, Advanced Access and the Gooder Group. It has also been recommended by national seminar speaker Gary David Hall, as an example of the praise that our content marketing tools and strategies have earned. 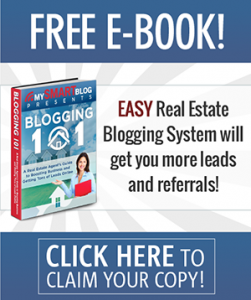 RealtyBlogContent.com is offering a free guide “Blogging 101: A Real Estate Agent’s Guide to Boosting Business and Generating Tons of Leads Online”. Why Real Estate Blog Content and Real Estate Articles? As an agent, you’re constantly bombarded by salespeople hawking the latest and greatest product or service. They tell you that you have to have this new product to build your business and generate real estate buyer leads fast and easy. “I love saving time and money by simply forwarding all those pesky emails promoting the latest and greatest real estate marketing products to the team at RealtyBlogContent.com for assessment. They thoroughly investigate them and advise me as to their value…or lack thereof.” Skip Eder, REALTOR®, St. Louis, MO. After nearly twenty years marketing in the real estate industry we’ve heard hundreds of stories from agents about the thousands of dollars they’ve spent on products and services. That’s why we created Realty Blog Content… to offer solutions to those two needs.